When you start your record with a sample lifted directly from dystopian masterpiece Network, you set a tone before you’ve ever played a note. 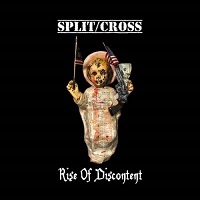 As that movie so famously says; “I’m as mad as hell, and I’m not gonna take it anymore!” That’s pretty much exactly where Split/Cross are at on ‘Rise of Discontent’, less a disgruntled metallic response to the state of the world as it is a headlong dive into Napalm Death style political grindcore with a side helping of filthy, sludgy low-end. There are no shades of subtlety with Split/Cross – it’s filthy music for the furious minded, ricocheting around various subgenres of extreme metal as they clatter through the likes of doom, sludge, d-beat, crust and grindcore. Entirely unwholesome, the band seem just as comfortable (if such a word can be used in connection with a record like this) firing off furious salvos like ‘Blindspot’ as they do slowing things right down on something like ‘Dis-Seption’. Quite where their strength lies best is left to personal taste; each is a more than proficient showing of the subgenre it inhabits, and it entirely depends on whether you prefer being run down by a rabid beast or stalked through the murk by something equally dangerous. One thing’s for sure though; when they do let loose, it’s something unbridled and fantastic, locking into filthy grooves in ways so few bands can. Think ‘Diktat’ by Napalm Death as a touch-point, and then compare that to the sheer fury of ‘Splinter’ just before the 2-minute mark; that riff is unkillable, locking in with the same kind of intensity that has earned the likes of Power Trip mass acclaim. Indeed, Split/Cross have much more in allegiance with the likes of Napalm Death or Halshug than they do with even the more extreme ends of doom like Conan, and while their utilisation of low-end certainly mirrors death/doom’s strongest tendencies, the band expand their influence so much further. In fact, it is the band’s usage of low-end as a strong emphasiser of their riffs that allows them to stand out from so many other extreme bands; there is no fret-wankery here, nor needlessly technical songwriting. Split/Cross tap into the primordial sense of simplistic anger to achieve their ends and provides something infinitely more organic as a result. That said organic matter is then smushed to pulp doesn’t matter; these songs feel hard-wired to get whole rooms gnashing teeth and clattering bodies, the perfect set-up for any extreme metal band. ‘Rise Of Discontent’ isn’t likely to make many critics’ end of year lists, nor will it innovate within the extreme metal spheres. But none of that matters; this is a record that was recorded, mixed and mastered in a single day, bypassing the trappings of overthinking by going straight for the jugular and holding on until all light leaves the world. ‘Rise Of Discontent’ is out now. You can get you get your copy HERE.